A podcast of a remarkable presentation by Bissera Pentcheva, associate professor of art and art history, Stanford University, delivered at the ‘Ways of seeing Byzantium’ symposium (18 October 2013) is available from the National Gallery of Art (Washington DC). Pentcheva draws together theology, aesthetics, architecture and chanted psalms in a study of the combination of mirroring, breathing and ‘in-spiriting’ in the performance of the Byzantine liturgy. 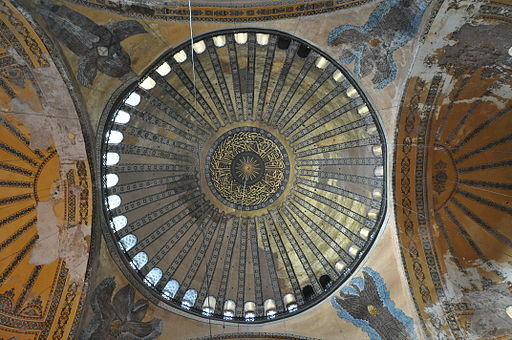 Working with Stanford University’s Center for Computer Research in Music and Acoustics, Pentcheva has recreated the ‘wet’ acoustics of Hagia Sophia in a recording studio, delivering live feedback to singers and allowing them to perform as if enveloped by the dramatic reverb and decay effects of the main dome. 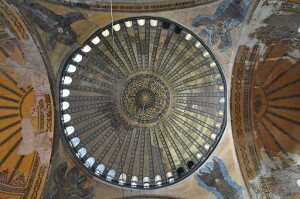 In her presentation, Pentcheva used these recordings to argue that, as echoes of psalms sung by cantors returned to them from the dome, the theological concept of ‘in-spiriting’—the descent of the Holy Spirit into matter—was enacted. Her evocative description of this acoustic effect as ‘sonic rain’ is borne out by samples of studio recordings. Enjoy these now but listen to the whole presentation to understand the full technical and analytical implications of what you are hearing. Pentcheva suggests that theological performances in an architectural space that is both acoustically and spiritually ‘live’ demand a redefinition of the idea of the icon: no longer a picture or portrait, the icon is highly conceptualised process of enactment. In itself a fascinating exercise in historical reconstruction, Pentcheva’s presentation provokes reflection on the ideas of ritual, representation and the body in contemporary performance art.